Can you believe it’s almost the end of the year already? We’ve had an amazing year and we’re already so excited for what 2019 will bring. We won Small Business of the Year Award at the UK Lingerie Awards! We did a fundraiser for Ovarian Cancer and raised over £2000 in the UK and $2000 in the US! Bringing our sister brand Wolf & Whistle back under our wing and being together once again! We now ship both brands from the same warehouse, so you can buy Playful and Wolf & Whistle together with ease! We shot the gorgeous Karen for our 2nd installment of our Ageless Fashion campaign. We created our first ever plus size Swim collaboration with Sports Illustrated babe Hunter McGrady. We launched our 2nd collab with the amazing Gabi Fresh, with two drops of amazingness! In addition to all this, we launched loads of amazing new styles, with epic photoshoots! However, enough about us! Some of us have New Years Eve parties to prepare for! The Caia Gold harness suspender skirt is such an amazing layering piece! Here we’ve layered it over a black lace dress to add a peplum effect. Pair with some chunky gold accessories and you’re ready to glitter at your party! The Bettie Page French Knicker gives the perfect amount of coverage to be worn as outerwear. Here we’ve paired it with a black bodysuit and the harness from the Juliet Wine bra. The French Knickers are stupendously swishy, so perfect for dancing in! The Harley body is the perfect piece to wear with black skinny jeans! It looks so simple and chic, and you can go OTT with the accessories to glam up your look. The Tanja bralet looks so cute paired with high waisted skirts, and this colourful number is a perfect compliment to it’s black eyelash lace. Mix and match bright accessories and you’ll have all eyes on you! What’s your favourite look? Will you be wearing any Playful Promises this NYE? It’s that time of year when the Christmas party invites come rolling in, but you just don’t know what to wear. Luckily, Playful have got you covered with some hot party outfit options including some of our super diverse lingerie! Everyone has a LBD in their wardrobe right? Instead of recycling the same old dress you’ve worn that past three parties, this time dress it up with the luxe Elvira cape! 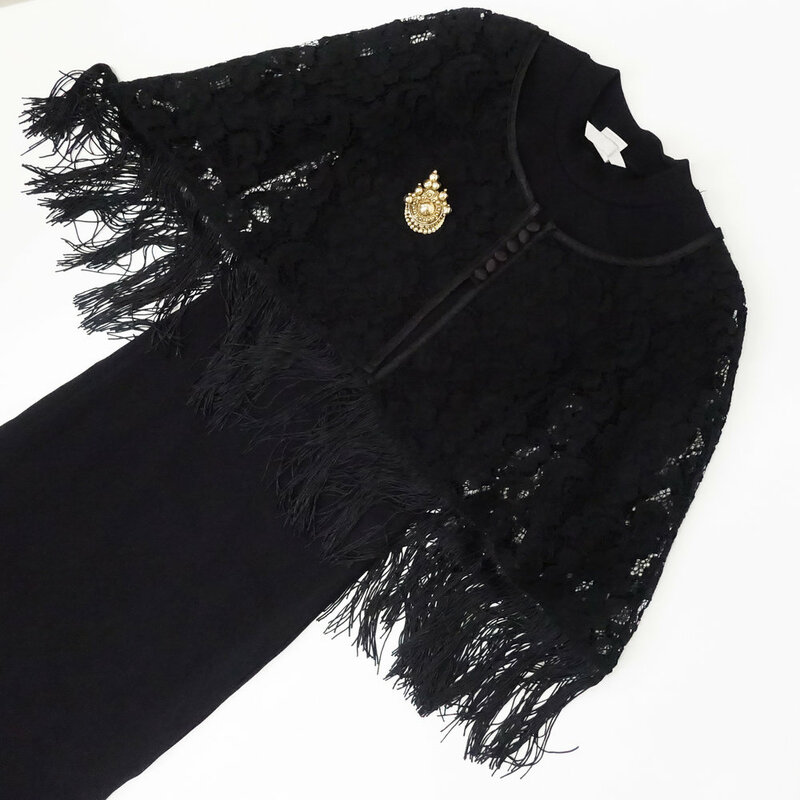 The lace compliments any block colour and the cape gives an extra layer of warmth during these chilly months. Accessorize with gold accents. This one is for those who can brave the cold - a pretty wrap-around dress is the perfect match for the Meret bra. Wear it so it peeks underneath the neckline. We love the colour-pop of the Meret Red, but the Meret Black would be a good option for those with darker tendencies. The silk PJ as outerwear was a staple of this years fashion trends. Our Red and Black Smoking Suit is the perfect transition from nightwear to partywear - just tuck in to a mini skirt and you’re giving effortless cool. Whats more - when you get home, you just need to chuck on the bottoms and you’re ready for bed! The Toyen Black is the perfect set to pair with a sheer dress or top, given it’s textured lace and fishnet and full-coverage style. One it's under this sheer lace dress, just a cheeky peek of skin will be on show! If you want a more daring look, why not try the Red Toyen instead? This one is perfect for cocktails and partying! Layer the Assa over a brightly coloured pleather skirt and a leather jacket on top. The longline style of the Assa makes it perfect for styling with high waisted skirts and trousers. Which of these outfit ideas is your favourite? Will you be wearing Playful this Christmas? We're all a bit guilty of heading straight to black clothes when we're not sure what else to wear. With this outfit you can still do that, but you can mix it up with different textures for a more interesting look! The Roxy Bodysuit is an ideal winter piece on account of it's velvet devore and mesh, it'll keep you cosy and feeling sassy. Pair it with a PVC skirt, and it's fringed choker for another layer of super-cool texture. Sequins & gems are a Christmas party staple. 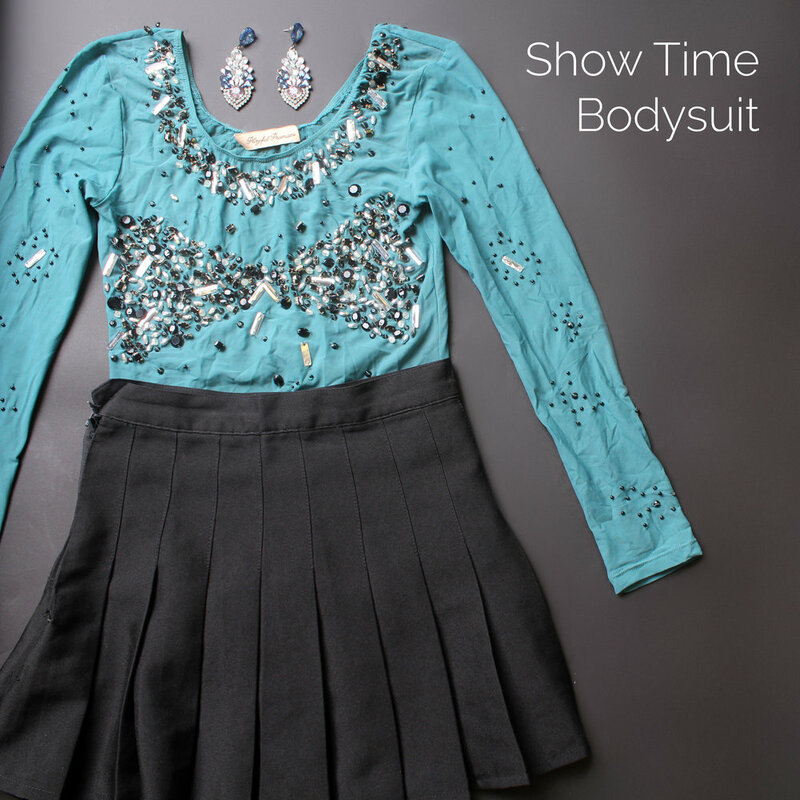 The Show Time bodysuit is dazzlingly bright and sparkly, and perfect for getting noticed. With something so sparkly, you can dress it with something simple like a plain tennis skirt. If you're feeling extra, wear glittery earrings and jewelled tights too! If sparkly isn't your thing, wearing a daring print with a brightly coloured longline bra is another sure-fire way to get noticed. We love the almost rockabilly-style look of the leopard print and Bettie Page Longline Overwire Bra together with some cute earrings. Wear with our seamed stockings to finish the look. Basques are a daring way to incorporate lingerie into your outfit, and the Carlota is ideal for that! The black dot mesh makes it easy to pair with anything, but we chose a tartan pencil skirt to look a little more eye-catching and festive. Top with a fluffy beret to keep your head warm and looking adorable over this otherwise sultry outfit. A vintage-lingerie inspired LBD and a floor length robe is a killer look when combined, and it's so simple to put together! The Leopard Print Robe makes any outfit look glamorous. Pair with vinyl heels and red lipstick to fully channel your inner femme fatale. What are you doing for Christmas this year? Which of these outfits do you think you could rock?